Base class for any "viewer" part. This class takes care of network transparency for you, in the simplest way (downloading to a temporary file, then letting the part load from the temporary file). To use the built-in network transparency, you only need to implement openFile(), not openURL(). To implement network transparency differently (e.g. for progressive loading, like a web browser does for instance), or to prevent network transparency (but why would you do that? ), you can override openURL(). 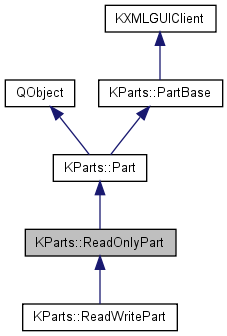 KParts Application can use the signals to show feedback while the URL is being loaded. Definition at line 338 of file part.h. Constructor See also Part for the setXXX methods to call. Definition at line 304 of file part.cpp. Definition at line 310 of file part.cpp. Definition at line 375 of file part.cpp. Emit this if loading is canceled by the user or by an error. errMsg the error message, empty if the user canceled the loading voluntarily. Terminate the sending of data to the part. With some data types (text, html...) closeStream might never actually be called, in the case of continuous streams, for instance plain text or HTML data. Definition at line 440 of file part.cpp. Called when closing the current url (e.g. document), for instance when switching to another url (note that openURL() calls it automatically in this case). If the current URL is not fully loaded yet, aborts loading. Deletes the temporary file used when the url is remote. Definition at line 385 of file part.cpp. Same as the above signal except it indicates whether there is a pending action to be executed on a delay timer. An example of this is the meta-refresh tags on web pages used to reload/redirect after a certain period of time. This signal is useful if you want to give the user the ability to cancel such pending actions. pendingAction true if a pending action exists, false otherwise. Emit this when you have completed loading data. Hosting apps will want to know when the process of loading the data is finished, so that they can access the data when everything is loaded. Reimplemented from Part, so that the window caption is set to the current url (decoded) when the part is activated. This is the usual behavior in 99% of the apps. Reimplement if you don't like it - test for event->activated() ! Definition at line 415 of file part.cpp. Returns whether the part shows the progress info dialog used by internal KIO job. Definition at line 321 of file part.cpp. If the part uses the standard implementation of openURL(), it must reimplement this, to open m_file. Initiate sending data to this part. This is an alternative to openURL, which allows the user of the part to load the data itself, and send it progressively to the part. mimeType the type of data that is going to be sent to this part. url the URL representing this data. Although not directly used, every ReadOnlyPart has a URL (see url()), so this simply sets it. true if the part supports progressive loading and accepts data, false otherwise. Definition at line 427 of file part.cpp. Only reimplement openURL if you don't want the network transparency support to download from the url into a temporary file (when the url isn't local). Otherwise, reimplement openFile() only . Definition at line 333 of file part.cpp. Call this to turn off the progress info dialog used by the internal KIO job. Use this if you provide another way of displaying progress info (e.g. a statusbar), using the signals emitted by this class, and/or those emitted by the Job given by started. Definition at line 316 of file part.cpp. Definition at line 327 of file part.cpp. Definition at line 400 of file part.cpp. The part emits this when starting data. If using a KIO::Job, it sets the job in the signal, so that progress information can be shown. Otherwise, job is 0. Returns the currently in part used URL. Definition at line 390 of file part.h. Send some data to the part. openStream must have been called previously, and must have returned true. true if the data was accepted by the part. If false is returned, the application should stop sending data, and doesn't have to call closeStream. Definition at line 435 of file part.cpp. If true, m_file is a temporary file that needs to be deleted later. Definition at line 523 of file part.h. Local file - the only one the part implementation should deal with. Definition at line 519 of file part.h. Remote (or local) url - the one displayed to the user. Definition at line 515 of file part.h.